The Barnsley and Rotherham Business Awards 2015 are now open for entries, with an added number of companies expected to get a special salute. Last year's awards were a big hit with the ceremony declared a sell out with three weeks to go. The event was held for the first time in Barnsley and will return to the Barnsley Metrodome to host the glittering event on Friday October 2015 and again organisers at the Barnsley & Rotherham Chamber of Commerce are expecting a high number of entries. Last year saw over 100 entries in the ten categories with top performers from the night being entered into the Business of the Year category. Entry is now open to all members of the Chamber and all businesses in Barnsley and Rotherham. 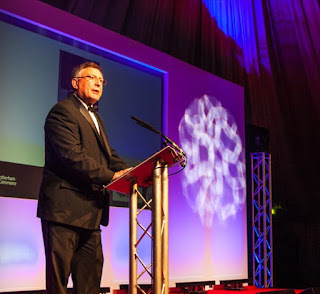 Andrew Denniff, chief executive at Barnsley & Rotherham Chamber (pictured), said: "This is a once a year opportunity for us to celebrate all that is best in business innovation, enterprise and growth across our region. "I would encourage as many businesses and individuals as possible to consider putting their names forward and get yourselves recognised for the tremendous results you have achieved over the past few months." Local companies celebrating significant milestones can mark them in style with a Salute to Business presentation. Businesses who have reached more than ten years in business can receive a Salute to Business award from Barnsley & Rotherham Chamber of Commerce as part of their annual Business Awards. Organisations celebrating 50, 75 or 100 years or more should contact the Chamber for the opportunity to receive the prestigious accolade on the night. Mark Hannigan, operations manager at the chamber, said: "Traditionally we have recognised five businesses at the awards ceremony in October but we have realised there are a number of great businesses celebrating milestones, so we have extended the opportunity to receive an award to throughout the year. "With our Salute to Business sponsor, Voot, we will be presenting certificates of recognition to businesses celebrating more than ten years of business in 2015. I would like to encourage any company who has reached a milestone this year to come forward and allow us to celebrate your achievement with you." Details of the award categories can be found on the awards website and the deadline for entries is September 4.